Back in January 2014, Sean Dyche made his first cash signing for Burnley, bringing Ashley Barnes in from Brighton for £450,000. But Dyche couldn’t afford the £300,000 to sign another target, Oldham Athletic’s young centre back James Tarkowski. Tarkowski moved to League 1 Brentford, but, two years later, with Burnley back in the Championship after a season in the Premier League, Dyche finally got his man – paying £3m. 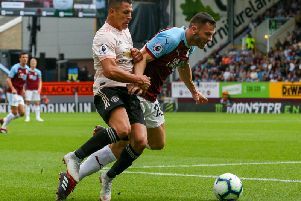 The 24-year-old Mancunian had to be patient for his chance at Turf Moor, as Michael Keane and Ben Mee built a superb understanding. But, after injury to Mee at the back end of last season, and Keane’s record sale to Everton in the summer, Tarkowski has taken his chance – and some, and is being linked with a potential England call-up. Dyche takes pride in players’ development, as with Nick Pope, while Charlie Taylor is another player he feels is pushing forward, despite not appearing in the Premier League. Dyche said: “It’s different levels of development. “When we got him (Tarkowski), he’d played quite a bit of first team football, he’d been in a young team at Oldham. We monitored him. “I wanted to sign him when I first got here, we couldn’t afford it, it was £300,000 and he went to Brentford. “But I kept my eye on him because I liked him. “I thought he had more. “We had to pay 10 times the money for him when we got him, but we kept developing him. “He had to sit and wait and work behind Ben and Keano, but he kept working, that’s the key thing. “Charlie Taylor is the next one. “Nobody has really seen him yet, but he’s progressing. “Nick Pope working beyond Robbo and Tom last season and progressing. “It’s a really appropriate way of a culture within a club.